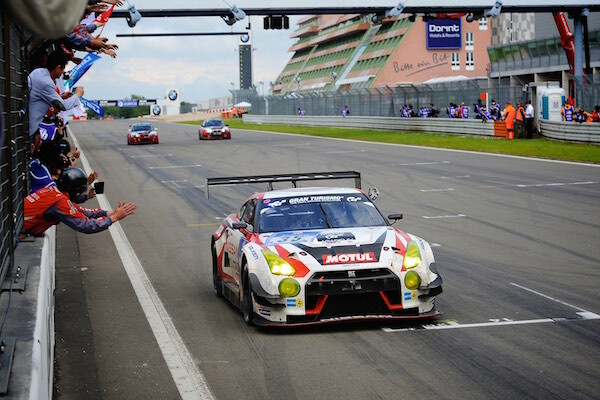 The Nissan GT-R NISMO GT3 of Nissan GT Academy Team RJN successfully came through one of the toughest tests in international motorsport at the weekend as it finished an impressive P11 at the Nürburgring 24h. The car (above), driven by Michael Krumm, Alex Buncombe, Kabuki Hoshino and Lucas Ordóñez, lined up alongside more than 150 other machines for the annual endurance race that is run on the Nürburgring GP circuit and the famous Nordschleife. An already challenging race was made even more tricky as torrential rain, fog and hail blanketed the 15.5-mile lap – eventually leading to the race being red flagged for four hours and the total race distance being reduced by 17%. But that didn’t stop the Team RJN quartet making their mark in the 100% reliable GT-R.
A faultless performance on track enabled the NISMO team to progress from their P24 qualifying slot to take P11 at the chequered flag. “Everybody did a great job, the drivers made no mistakes, we had no penalties and the car did not fail at any point at any time,” Nürburgring expert Krumm said. A second Nissan GT-R NISMO GT3 also lined up for the Nürburgring 24h as NISMO customer, Team ZAKSPEED, fielded a car for Marc Gassner, Florian Strauss, Tom Coronel and Hendrik Still (above). The car qualified P37 in the SP9 category but it was unable to build on its impressive P6 showing at April’s Qualifing Race when the main 24-hour encounter got underway this weekend. The car suffered technical difficulties during the night and was forced into early retirement. Elsewhere, the Nissan GT-R NISMO GT3 also raced in North America’s Pirelli World Challenge and in the Italian GT Championship at the weekend. The Always Evolving/AIM Autosport team headed to the tight and twisty Lime Rock Park track in Connecticut for rounds 10 and 11 of the Pirelli World Challenge. The first race of the weekend proved a tough encounter as Bryan Heitkotter recorded a P10 finish and James Davison notched P12 in their AE Replay XD Nissan GT Academy machines. But both drivers fought back in fine style a day later as they finished well inside the top-10. Davison was P5 and Heitkotter was P7. In the Italian GT Championship, the Drive Technology Italia customer team took part in only its second event of the 2016 season. Francesca Linossi and Lorenzo Bontempelli spearheaded the team’s attack at Imola (above) and returned an encouraging P9 in the dry first race of the weekend after qualifying in P12. However, atrocious weather conditions denied them the opportunity to build on their race one result when race two got underway on Sunday. Heavy rain made for driving conditions that were too dangerous in the eyes of the race official and they elected to red flag the race at lap 11 after a number of cars slid off the road. That meant Linossi and Bontempelli were unable to continue their charge through the field – they had already made up two places on their grid slot – and climb any higher than P12.